"I can't afford to hate people. I haven't got that kind of time." It's a pretty fair bet that all of us who contribute reviews to dOc and other websites (and those who read them) each have some sort of DVD holy grail, the title that exemplifies for them the reason to own a DVD player. No doubt many prayers were answered last year with the release of the Indiana Jones movies, and for many more the magic titles are the original Star Wars trilogy; one of the many fun things about reading dOc's 2003 Top Ten lists was seeing the enthusiasm of my colleague Jeff Ulmer for the release of The Swimmer, maybe not the most widely celebrated film of all time, but one obviously dear to his heart. Well, here's mine. Ikiru was the reason I bought a laserdisc player (you know, the Betamax of DVD) back in the day, and its release on DVD by Criterion is cause for celebration. It's probably not Akira Kurosawa's most famous film, but I'd put up a pretty fair argument that it's his best. It comes from Kurosawa's most fertile artistic period, when he first received international acclaim; it doesn't always get the plaudits accorded to Rashomon (which preceded it) and Seven Samurai (which came next), and it's not difficult to understand why. Ikiru doesn't have the epic sweep and scope of Seven Samurai, nor does it investigate the very nature of truth, as does Rashomon; it's merely a beautiful and poignantly told story of a man forced to examine his own life, but that's more than enough. Takashi Shimura plays Watanabe, a Tokyo civil servant who hasn't missed a day of work in thirty years�he's the very definition of a salariman, and has become something of an office joke to his underlings, with his absurdly officious paper pushing. Even before he does, we receive the bad news, via voice-over: Watanabe-san has stomach cancer; it's incurable, and he has at best six months to live. The stacks of memos and permits on his desk, his whole life as Public Affairs Section Chief, now seems inconsequential, some sort of cosmic joke�how can this sick old man learn to find pleasure and meaning in his life in his last days? He won't find it with his son, Mitsuo (Nobuo Kaneko), for that ship has sailed long ago�work came before family for Watanabe, and now Mitsuo only wants to know if he can secure a mortgage using his father's pension as collateral. (Watanabe has long been widowed, and has ignored his brother's plea to remarry.) Watanabe finds a couple of guides on his journey�the first is a novelist (Yunosuke Ito) he meets drinking, willing to play the Virgil to Watanabe's Dante, showing him the seamier side of Tokyo nightlife. But this is unsatisfying, even to Watanabe with his ticking clock�next is Toyo (Miki Odagiri), a young woman in Watanabe's department, who has the vitality that Watanabe feels he has always lacked. (He implores her: "How can I be like you?") But soon, she's creeped out by him, too, this sick old man lavishing attention on her; his family mistakes her for his mistress, but only sadness comes. Much of the storytelling is old-fashioned�the voice-overs, the flashbacks, the wipes jumping us from scene to scene�but thematically, it's a timeless piece of work. We're left with two competing visions of humanity, basically�the changed Watanabe and those who would follow his example, on the one hand ("The world is a dark place if his dedication was pointless"), and the majority on the other side, who will get drunk and sob at his wake, and then return to bucking responsibility from desk to desk to desk. It's just an astonishingly beautiful movie, and it's with gratitude and joy that I get to write about its arrival on DVD. Image Transfer Review: The film looks vastly superior than it has on any previous release, and it's markedly improved from Criterion's creditable laserdisc. But still, there are some problems�a good number of both vertical and horizontal lines disrupting the frames, reel change indicators, even some odd flicker and jumping of frames. It doesn't look bad, but these instances are worth noting. Audio Transfer Review: The mono track occasionally sounds oddly muffled, but Kurosawa's delicate sound editing, particularly his uses of silence, are well conveyed here. Extras Review: A respectful extras package help to shed light on Ikiru in context, both in terms of its director's career, and of its historical moment. As he did for Seven Samurai and Ran, the redoubtable Stephen Prince provides and informative and chatty commentary track�he's especially good at helping English-speaking audiences appreciate many of the things that must have been obvious to Kurosawa's original Japanese audience. (For instance, Watanabe's doctor tells his patient that it's only an ulcer, an obvious lie to them both; this kind of lying was apparently considered an appropriate bedside manner.) He's also knowledgeable about the world outside of movies, which is always welcome�one of Kurosawa's uncredited sources for the screenplay was Tolstoy's The Death of Ivan Ilych, and Prince quotes from Tillich and Kierkegaard. Disc One also contains color bars and an original trailer. Disc Two offers two informative documentaries on Kurosawa's career. A Message from Akira Kurosawa: For Beautiful Movies (01h:21m:17s), produced in 2000, offers a brief biographical overview, and then concentrates on the director at work, from the writing process through storyboarding, shooting and editing. It's a great opportunity hear and see Kurosawa, though the emphasis is decidedly on the later pictures; most of the examples are culled from Madadayo and Rhapsody in August. And if what's here is representative, he was mighty rough on his actors�typical direction to one of them: "Try to do it as I explained." Akira Kurosawa: It Is Wonderful to Create was apparently a series produced by Toho Masterworks, and here we have the episode (41m:35s) on the making of Ikiru�it features interviews with cast members, co-screenwriter Shinobu Hashimoto, and several other production team members, including the script supervisor and art director. There are great production details, and many clips, which can seem a little redundant if you've just spent some time watching Disc One of this set. Especially interesting here is the biographical information on Takashi Shimura. Though this has a January release date, it's hard to imagine a finer film being released on DVD in this or any other year. 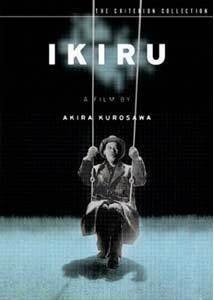 Ikiru is perhaps the finest film by arguably the greatest director in cinematic history, and it has lost none of its power, poignancy or deeply felt emotion. I couldn't recommend this more highly.